For decades, the business of publishing fiction didn’t seem to change much. In fact, for a major industry, it stayed stuck solidly in practices decade after decade, with only slow and often minor-seeming shifts. But now something changes daily in this business. The point of this blog is to try to explain why some myths exist and why some bad information gets taught still by very smart people. And I hope the best way to show this is to just show the changes in agents over the years. So let me take on once again the biggest and most powerful myth of all: Agents. And how we writers got into this mess. Follow along with the changes in writers and agents from 1940 until today. In the era around 1940, literary fiction agents existed, but only in a minor way. Fiction writers still dealt directly with editors, often going to their offices. Some agents worked with writers for Hollywood and some agents worked with a few writers to deliver manuscripts to New York editors for writers who lived outside of New York. But agents did very little else. And they took 10% when they did manage to place a story for a writer. 95% or more of all writers sold their own manuscripts directly to editors. By the era around 1970, fiction agents had worked into a more solid position in the business, since many fiction writers now lived outside of New York and the numbers of writers and books published was exploding. The fiction publishing industry had gotten past the huge distribution collapse of 1958 and was settled. A fiction agent’s job during this period was to do the grunt work for most writers. The agent sometimes sold books by delivering a manuscript to an editor (usually by messenger across town after a phone call to the editor). But most books were sold in face-to-face between writers and editors, or direct pitches from writers, often over lunch or dinner. Not all, but most. For beginning writers, they sent their books directly to publishing houses and into huge slush piles. Young editors were getting their starts in the slush piles of publishing. These slush piles often filled entire rooms in a publishing house. But the young editors could get a promotion by finding a book that would sell. Also, some pretty underhanded agents were in business at this point, many charging reading fees. One major agency, The Scott Meredith Agency, had writers as first readers in their reading fee program. That program trained many of today’s major writers. Also Scott trained numbers of today’s major agents, be that good or bad. Agents handled contracts and chasing the money and getting the bestselling writer’s coffee. They often did support for writers in trouble, sometimes lending them money if needed. And if they were involved with a book, they got 10%. This period was the start of the myth that agents took care of a writer. For a few writers, the agents needed to help at times. But most professional fiction writers needed little agent help and many writers didn’t yet have agents other than for Hollywood. This era also started the myth that you need an agent for Hollywood. And at this point a major way to break in was sell to magazines first, then have editors see your work and come to you for a book. This happened to me as well. In the mid-1990s, another major distribution collapse started and continued through the early part of this century. This caused many numbers of publishers to merge and a focus away from midlist and toward more bestsellers. This also brought in the rise of power of the publishing house sales force and the loss of editor’s abilities to just buy a book without approval. Around 1990, a fiction agent’s job was mostly to chase money and help with contracts that were getting more and more complex. The fiction agents sold a few books, but not many, mostly just delivering books to editors the writers already knew. During this period agents started to link more with overseas agents who tried to sell the agency’s bestselling client’s books to translation rights overseas. This is where the myth that agents sell overseas rights started. Except for bestsellers, it still is a complete myth with very few exceptions. Around 1990, agents often helped writers in many, many ways. They would submit books if the writers wanted them to do so, often keeping a book in the mail to fifty or sixty editors or until the author called enough. Agents during this time would support writers with money, often making loans to writers who were in need and waiting for checks from publishers. Fiction agents of this period knew the fiction publishing contracts of the time and were able to help writers with those contracts. Agents also, at times, helped on the promotion side of things, making sure a book didn’t get forgotten inside a publishing house. The 1990 period (roughly from 1980 to 1995) was the best time for the agent/author relationship and where so many of the myths of today come from. But somehow during those years agents raised their payment rate to 15% and authors just let them across the board. A sign of the problems to come in the next twenty years. Around this point publishers had added in the little “agented submissions only” to guidelines that all beginning writers look at. The move was on by beginning novelists from selling a book to a publisher to trying to “get” an agent, a person who could not buy anything. At the same time, young editors were getting fired as the consolidation after the distribution collapse was settling out. Hundreds and hundreds of young people, mostly women, many former editors, flooded into agenting to cover the push of manuscripts headed toward agents because of the stupid change in fiction publisher’s guidelines and the masses of uniformed writers who didn’t know how to go around the guideline. All the young agents, as former young editors, thought they knew what would sell, thus the birth of agents having writers rewrite, a practice that would have been a firing offense just ten years earlier. No agent would have dared tell a writer their job. Ever. But now thousands of young and uninformed fiction writers were letting agents tell them how to write a novel. And thinking it normal. The older agencies that had formed in the 1970s and 1980s retreated out of the spotlight and are now the major agencies working with mostly bestsellers, while the baby agencies fought to find that piece of gold in the slush from an unknown new writers, just as junior editors used to look through publishing house slush piles thirty years earlier. With the huge increase in agents, editors stopped paying much attention to the agents and most of the new agents, unless personal friends with the editor, got their client’s manuscripts as far as an editor’s slush pile (if they bothered to mail it to an editor they didn’t know). The bestselling fiction writers flocked to more powerful agents or fired their agents completely, moving to lawyers. The writers coming in during this 2005 period (give or take three years) all still heard from more experienced writers how the agents of old treated writers and how good those days were. The newer writers believed the guideline that they had to have an agent to sell a book, and they believed the old myths that agents were needed to take care of them and sell overseas rights. So for an entire decade, the writers lucky enough to get through this system also taught it to younger writers, believing it was the way things were done. Because for them, it was. And for the older writers with agents who were still working fine, the agent system was the right way for them as well. Remember, during this time, just as now, a fiction writer didn’t need an agent to sell a book. A fiction writer didn’t need an agent to take care of them. And a fiction writer certainly didn’t need an agent for overseas or Hollywood sales, since e-mail by this time was a norm for everyone. But thousands and thousands of new writers believed deeply that all they were being told was completely true. It was, just not for them. It was true for the writer’s doing the talking. This period gave rise to the young, unsold writers who gambled their entire careers on finding an agent. When any other way but the agent way was suggested, the idea was met with out-of-proportion anger from the young writer. It makes sense, actually, since any hint that the new writer might not be doing things right and had wasted years and years of time would crush most people. This anger from the great group of uninformed writers forced most long-term writers into the background. And it made the agent topic became a third rail of publishing. No professional writer dared touch it. Kris and I during this time used to hate every time anyone asked us about agents and we more-than-not avoided the question because our advice just caused problems. There are still very few long-term writers who are willing to touch this topic because of the anger of the group of unpublished or newly published writers. Many long-term writers are still with their old agents from the 1990 system and it’s working great for them. They have no need or desire to pay attention to what younger agents are doing to an entire generation of younger writers. It’s not their business. Why should they care ? That’s why you will never see a major bestseller even talk about this topic, or bother to learn what is happening to the young writers of today. A few of us who have been teaching over the last ten years at times have come awake to the problem. And some longer-time professional writers like Laura Resnick got rudely awoken to the problem by a series of really rude events from agents she trusted. She is also now a major fighter for writers in this area. Also during this period, the specialty of Intellectual Property Attorney started to grow as more and more artists, writers, and software designers started to hire an attorney to deal with the extremely complex contracts. Holy smokes, have things changed in a very short time. The third major distribution upheaval of the last sixty years has rocked publishing with the introduction of new technology in e-readers. And with this new technology, the traditional publishers lost their grip on the distribution system for fiction and allowed writers to just easily walk around the publishers and straight to readers and bookstores by indie publishing their own books. Interestingly enough, traditional publishers don’t care and are using the new system as a large slush pile that they can find good, reader-tested books to buy. Paper books are going down in sales numbers. Traditional publishers complain about this, but honestly don’t care much because they are moving from a nasty returns system in paper books that allowed a 4% profit to a new system that gives them upwards of 40% profit margins in electronic sales. This huge extra profit was a gift to publishers back a few years by writers and really, really stupid agents who allowed a writer’s share of electronic publishing to move from 50% of cover to 25% of net. Wow, what a stunning reduction in payment, yet all publishers made the move at once and all agents and most writers caved. As I have said before, after this short transition, traditional publishers are going to be making money hand-over-fist and looking for every book they can get in print forever. Advances are way, way down as the paper book sales collapse and the electronic book sales are not counted much at all by agents and writers except indie writers. 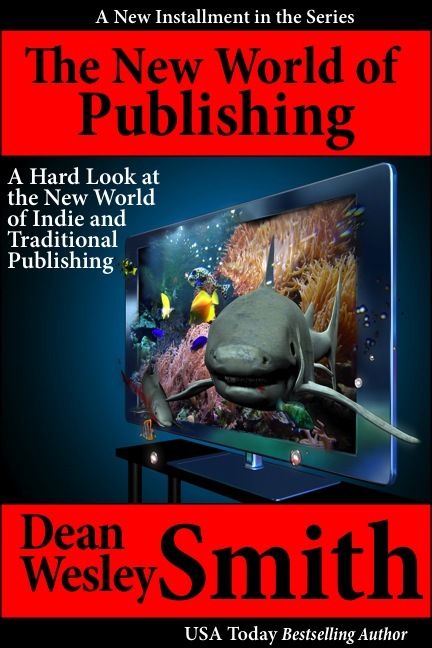 Publishers have tightened up dramatically to make this transition. With sales tight and advances down, agents are failing by the droves. And many agents are rushing to become publishers, because honestly, that’s where the money is now. They see their own eventual demise as an agent. Many editors have just given up on the agent system and are looking for good books anywhere they can find them. More and more writers are starting to finally wake up and realize that they can send editors books directly. And contracts are so complex, most agents don’t understand them, so more and more writers are hiring IP lawyers. Agents today are also unwilling to fight any more for their authors. They have basically shifted over to being scouts for a few publishers and don’t dare stand up on an issue for fear of angering a publisher. This change happened just in the last five years or so and is the most startling change of all in my opinion. A writer hires an agent thinking they are going to help them, but the agent actually isn’t working for the writer at all, but for the publisher. But IP lawyers are bound by ethics (more than agents) and have no problem fighting for you in contracts and negotiations. My suggestion is that these days, even if you have an agent, hire on an IP lawyer to help with the contract. The biggest change now is that writers now have choices. We are not forced to only stay with traditional publishing and forced by myth to have an agent do nothing for us. We have options on books agents would never send out, or that are too risky for a tight publishing industry. This choice gives writers power again, and with luck, we can start turning these trends around. So how does bad information get taught? One: Writers who still have a good agent from the 1990 period tell young writers they should find a good agent who will help them. It’s good advice from that writer’s perspective because that writer only knows that system. It is true for the experienced writer doing the talking to the new writers, but it sends a very, very bad message in this new world. Two: Writers who have been lucky enough to make it through the agent system in the last ten years tell newer writers that’s how they did it, and how good their agent is. And that advice is true from the speaker’s perspective. But again it forces beginning writers into a very, very bad place, often losing years and books and entire possible careers to some agent stuck on having a writer rewrite everything. And that is how this huge third rail of publishing myth continues on just as strong as ever, even though agents are not what they were simply fifteen years ago. Some basic truths I have said over and over here in different ways. Being an agent has changed drastically in the last few years. “Getting an agent” isn’t critical to a writer and never really was. So in this new world of 2011-2012, let me offer a few basic agent truths. 1) Agents can not take care of you in business. 2) Agents are not the best people to sell your books. You are. You know your book better than anyone else. You do not need an agent to sell books. 3) Agents who become publishers should be avoided at all costs. 4) Never let an agent have your money. Split all payments from the publisher, especially as agents and agencies are starting to run out of money and fail. 5) Modern publishing contracts are so complex, have an IP lawyer read it and do your negotiating for you. 6) Agents can’t buy a book. Follow Heinlein’s Rules. Only rewrite to someone who can pay you for your work, and then only if you agree with the rewrites. Agents can not buy books. No one method is right for everyone. In my opinion, it’s all right to have an agent if your agent is still working in the 1990 system. But a new agent who is trying to be a publisher is to be avoided in my opinion. But no matter if you have an agent or don’t, are traditional publishing or indie publishing, writers need to open up to the sudden changes that have happened and understand how they have changed agents and the business of how agents fit into publishing. Stop acting on advice that was good advice in 1990, but not so good in 2012. Stop letting agents run you around. We writers have options now. Learn what your options are, learn business. You do that and take back your career and your writing will be a ton more fun. Okay, I admit it, I had issues at first with putting in a tip jar in the Magic Bakery. It was one of the “I have it made, why do I need to support my writing with tips.” A minor myth, sure, but still one that took me a few days and some talk with Kris to get past back when I started doing these blogs. And speaking of the Magic Bakery, this chapter is now part of my inventory in my bakery. I’m giving you this small slice as a sample. I’m giving you a taste, but not selling any of the pie.